At Pride Auto Care, Full Service Tire and Auto Repair, we specialize in tires, auto service and all factory maintenance services. Timing belts along with water pumps (see below how these components operate) and related internal components are some of these important automotive services. Check your owner’s manual for the proper interval to replace your timing belt and water pump or stop in and have one of our service experts review your car or truck’s maintenance needs with you one-on-one. Generally, the idler pulleys, tensioner and water pump should always be replaced when the timing belt is replaced. In most cases, the timing belt drives the water pump, so it is the right time to replace the water pump. It is also recommended by the manufacturer. WORD TO THE WISE. Be careful when you call for an “over-the-phone” estimate for replacing a timing belt and/or water pump. Less trustworthy shops will quote you what seems like a great price to get you in the door and not indicate the “whole” story (see above). The vast majority of the time, it makes complete maintenance and dollar sense to do the “whole enchilada” at the same time — the timing belt, water pump, tensioner and idler pulley — because if it’s time for one, the other units are usually not far behind. Check your owner’s manual for details. The less scrupulous repair center gives you a low-ball estimate to do either the timing belt or the water pump…minimal parts cost and minimal labor. They get you in and your car disabled on the hoist, then they call and say, “Guess what you need…?? ?” You guessed it…you need the whole timing belt and water pump kit which includes the other smaller worn mechanical components (i.e. new idler pulley, new timing belt tensioner) that your quote should’ve included in the first place! Hello! The labor cost difference to do both units at the same time is virtually non-existent in most vehicles because, in many cases, you have to remove the water pump to get to the timing belt! The cost of most water pumps is minimal when compared to having to pay all that labor AGAIN, plus cost of a water pump, in the not-so-distant future when the water pump blows out! In our humble opinion, it’s deceptive not to quote you the real total cost to get both the timing belt AND the water pump + the small ancillary parts all done at the same time. NOTE: Make sure to check out our coupon page at www.prideautocare.com.We have some great coupons there that can help you save money or these more expensive but timely repairs and services. .
What is a timing belt and why timing belts need replacement? 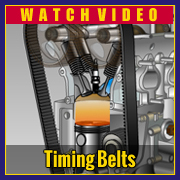 Timing belts have replaced timing chains on many of today’s engines. Both belts and chains ensure that crankshaft, pistons and valves operate together in proper sequence. Belts are lighter, quieter and more efficient than chains. How does a car’s water pump work? As a car’s engine operates, it generates high temperatures within the motor. This heat must be handled appropriately and the motor kept cooled at a proper operating temperature range, or the vehicle will suffer potentially catastrophic failure…you’ll blow it up. 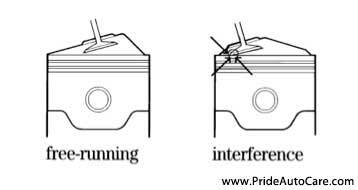 Generally, a vehicle’s water pump, driven by the motor via the timing belt (or serpentine belt in some models), circulates the coolant/antifreeze around the “water jacket” of the motor, and back through the radiator thus cooling it. It also facilitates circulating coolant/antifreeze through the heater core of the car so you can stay warm in the winter. FYI… coolant/antifreeze are essentially one and the same thing! Just so you know. Since its operation is controlled by engine activity, the water flow-rate of this pump is regulated by engine’s RPM. A thermostat is also in the loop. It essentially helps in regulating the flow of the coolant, based on the engine’s temperature. As the engine RPM increases, so does the rate of water flow. That helps in maintaining a proper engine temperature. 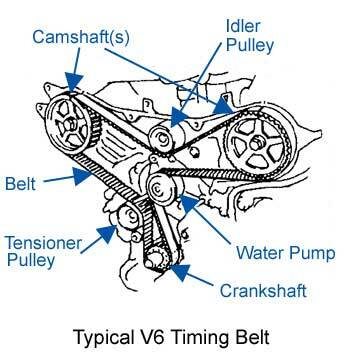 The timing belt runs the water pump and maintaining both is critical to a vehicle’s operation and longevity. Like other components, timing belts wear out. Proper maintenance requires timing belt replacement at regular intervals–before they break. Where are the belts located? Timing belts are on the front of the engine protected by a plastic or metal cover. When should belts be replaced? When a timing belt breaks, the engine stops. Replace belts before this occurs. Most manufacturers provide a suggested service life and replacement schedule for this critical component. Check your owner’s manual for the interval to change the timing belt for your vehicle. How do I know if my car has one? Your vehicle manual may tell you, but you should ask your auto service or auto repair shop or local certified technician–they will know for sure. What is a “Free-Running” engine? If the timing belt breaks on a free-running engine, the engine stops and you will need a tow to the repair shop. No mechanical damage occurs and the installation of a new belt is usually all that is needed to get you on your way. What is an “Interference” engine? NOTE: Make sure to look at our coupon page at www.prideautocare.com. We have some great coupons there that can help you save money on these more expensive but timely repairs and services. NOTE: Pride Auto Care is equipped with an automotive information system that provides detailed data for all makes and models of automobile and light trucks on the market today. The ALLDATA system even lists high-tech specialty lubricants required for your particular car. Other information includes vehicle specific repair and diagnostic information and factory-issued Technical Service Bulletins. The bottom line is efficient, dependable and cost-effective service for you.